Madigan made… a simple, handmade Mother’s Day gift idea. 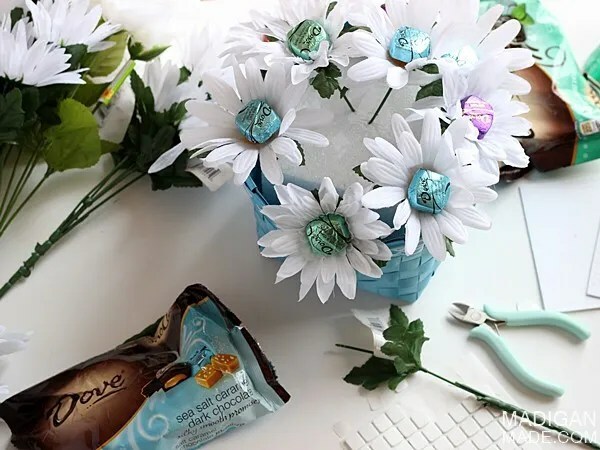 This simple handmade gift idea is sponsored by DOVE® Chocolate. All opinions, as always, are 100% my own. I know I mentioned this to you last week, but sometimes certain foods remind me of specific friends or loved ones. Raspberries remind me of my grandmother. Do you know who chocolate reminds me of? My mom. She’d encourage me to pick out a chocolate candy bar for the two of us to share. I’d run over to the register and select the candy with excitement. We’d go home and enjoy our special chocolate treat together, just the two of us. (OK, I’ll be honest, sometimes we couldn’t wait and we’d split that chocolate in the car before we got home!) It’s a sweet little memory that reminds me why I love chocolate. As it turns out, I married into a chocolate-loving family. My mother-in-law loves chocolate, too! 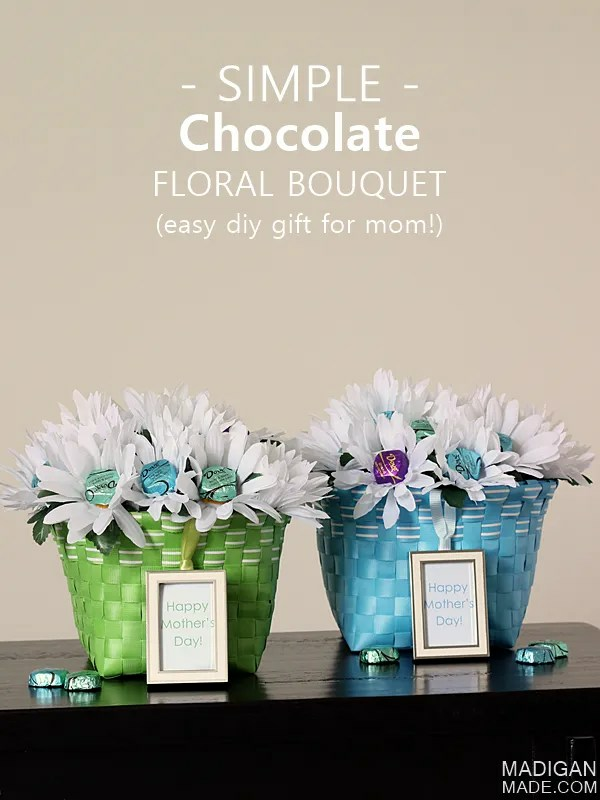 So, when DOVE® Dark Chocolate offered to send me some of their silky-smooth dark chocolate for a Mother’s Day craft, I knew this product was the perfect match for both my mom and my mother-in-law! 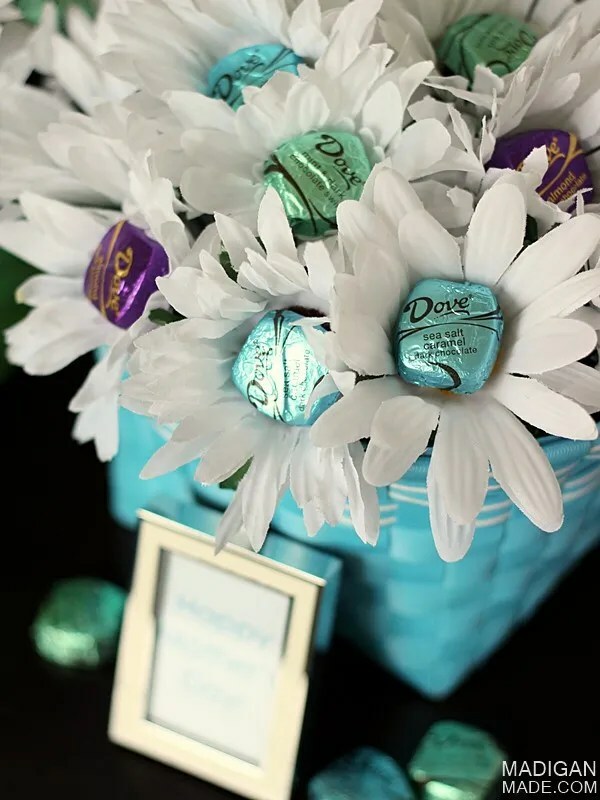 They both also love flowers, so I decided to make them a floral bouquet in a basket filled with a special treat they both love… chocolate! I also added a silver and enamel frame to the front of each basket. I placed a “Happy Mother’s Day” sentiment in each one, but I’m hoping our moms can use the frame down the road for pictures of our sweet little baby that is on the way! 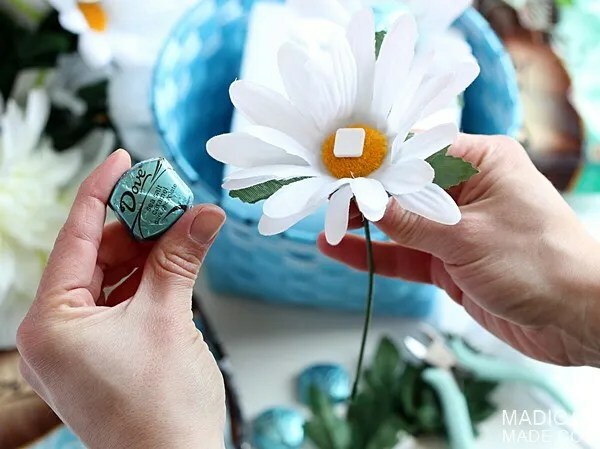 Apply a foam mounting square to the center of a silk flower. Remove the other side of the tape and gently press a chocolate piece onto the tape. Trim the wire stem if needed and stick the stem securely into the foam. Repeat steps 2 and 3. Add more chocolate and floral stems to the foam block. 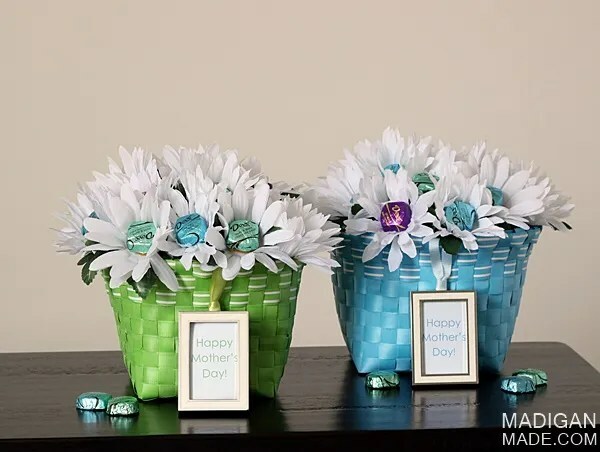 Add enough stems to create a full bouquet in the basket. 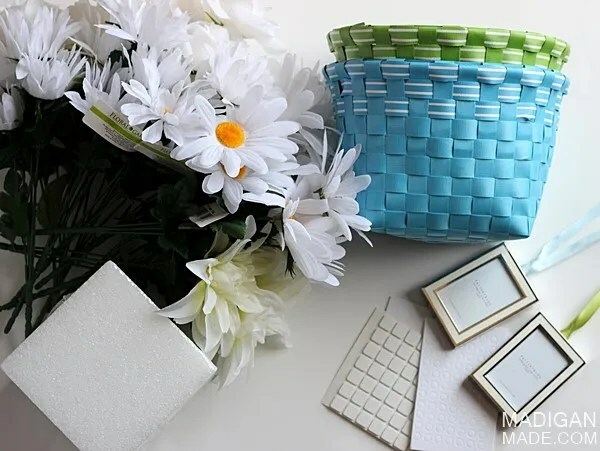 If desired, attach a small frame to the front of the basket using ribbon. You can add a picture or saying in the frame that is important and unique to your mom. I’m looking forward to giving these baskets (and chocolate!) to my mom and mother-in-law. I’m also looking forward to the day when I can share a special chocolate treat with my little daughter that is on the way. Chocolate-lovers seem to run in our family, so I have a feeling she will be one, too! 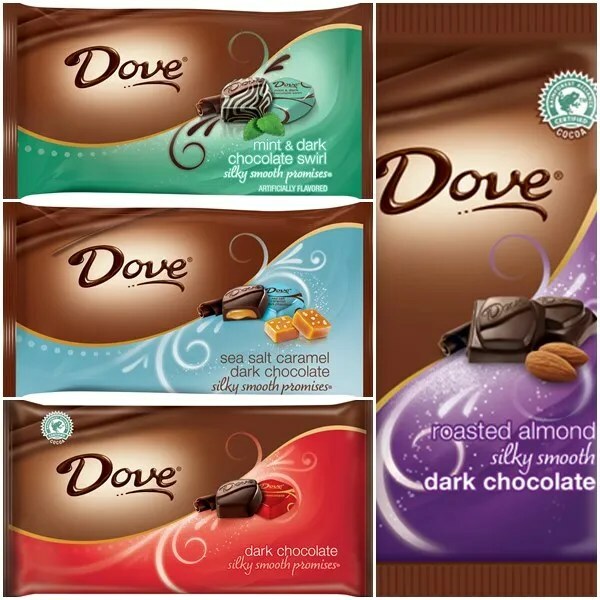 Available in several sizes (2 sizes of bars and smaller PROMISES®) and four flavor varieties, including new DOVE® Silky Smooth Sea Salt Caramel Dark Chocolate, I’m sure there is a flavor of chocolate your mom is sure to love. 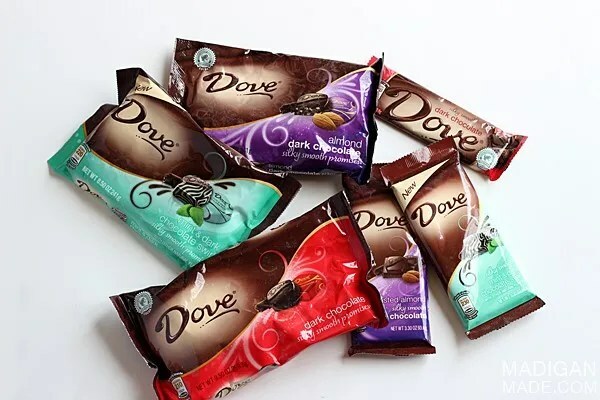 And if you (and your mom) love dark chocolate as much as our family, be sure to follow DOVE® on Facebook and Twitter for more tempting products and creative chocolate gift ideas.